I use RapidCRC Unicode (0.3.11) for Windows to generate md5 checksum files for various source files, mainly huge video footage, but it can be anything of course. Footage files, since large, can easily be subject to data rot due age or other electromagnetic effects influencing data consistency. RapidCRC can also be used to check data integrity – this works flawlessly. But as soon as the footage file including md5 checksum file is copied to a Unix system, md5 checksum checks get complicated since the Unix md5sum command doesn’t cope very well with RapidCRC created checksum files. The reason for this is that Windows uses CR (carriage return, 0x0d) followed by LF (line feed, 0x0a) to terminate a line while Ubuntu only uses LF (line feed, 0x0a). 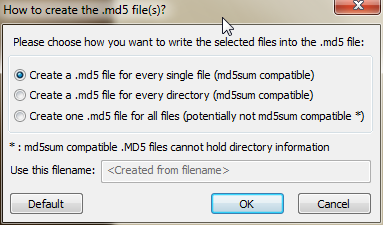 No big deal, but md5sum simply doesn’t cope with (see below). Despite that the fact that md5 states that the generated checksum file is md5sum compatible, this doesn’t seem to be the case. This is a RapidCRC generated md5 checksum file (text and hex code). Notice the 0x0d and 0x0d at the end of the (only) line. root@ganymede:/media/raid-main/# transfer# cat "movie 1.mpg rapidcrc.md5"
root@ganymede:/media/raid-main/# transfer# xxd -c16 -a "movie 1.mpg rapidcrc.md5"
0000020: 202a 6d6f 7669 6520 312e 6d70 670d 0a     *movie 1.mpg..
Now the md5sum details (text and hex code). Notice the 0x0a at the end of the (only) line. root@ganymede:/media/raid-main/# transfer# cat "movie 1.mpg md5sum.md5"
root@ganymede:/media/raid-main/# transfer# xxd -c16 -a "movie 1.mpg md5sum.md5"
0000020: 2020 6d6f 7669 6520 312e 6d70 670a         movie 1.mpg. Apart from the above mentioned line termination, an * in front of the source file name is also a difference. However this doesn’t seem to disturb md5sum. The test directory shows the source file itself, the RapidCRC generated md5 checksum file and, for movie 1.mpg only, the md5sum created md5 checksum file. Now … if md5sum is applied to the RapidCRC md5 checksum file, an error shows. The md5sum md5 checksum file is accepted without errors. root@ganymede:/media/raid-main/# transfer# md5sum -c "movie 1.mpg rapidcrc.md5"
root@ganymede:/media/raid-main/# transfer# md5sum -c "movie 1.mpg md5sum.md5"
If the stdout of sed command is piped to md5sum command, the RapidCRC md5 checksum files can be used to check data integrity.